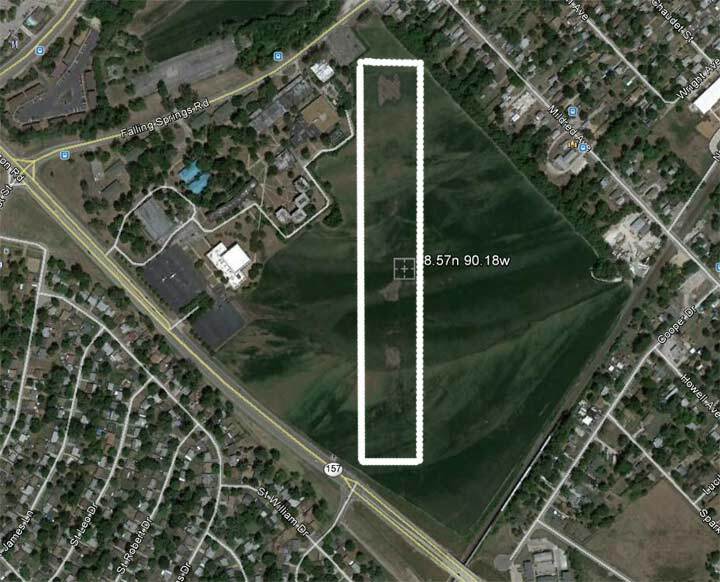 Called variously Parks Field, Parks College Airport or Parks Airport, the field was located in East St. Louis, Illinois. It was founded in 1927, during the wave of interest growing in aviation after Charles Lindbergh’s trans-Atlantic flight. An early aerial photograph of the Parks Airport is below. This photograph was snapped during the activities surrounding the Gardner Trophy Race, held May 28-30, 1929. The photo is from the St. Louis University Digital Collection (SLU). Interestingly, there is a light-colored aircraft fifth from the the bottom of the row of airplanes at the right side of the photo. This is probably the "White Cow," flown by Sydnor Hall. It was the Travel Air he identified as NR6239. Later, Parks Airport was described in 1937 from this REFERENCE in the image below. The description notes a "radio receiver," but does not mention a transmitter. Parks Airport was a hub of Golden Age Aviation. It was relatively easy to find from the air, given its juxtaposition to the Mississippi River. The greater St. Louis area was known for its manufacture of Curtiss-Robertson aircraft, as well as the Parks line of four aircraft models locally manufactured by the namesake of the field, Oliver Parks (at least 16 landings were made and logged in the Parks Airport Register by pilots flying Parks aircraft). The field was known for its flight training activity, flight exhibitions and pleasure flights. The military from nearby Scott Field landed there occasionally. Below is a view of Parks Airport found in this 1938 REFERENCE. You can read "PARKS" on the building near the left center of the photo. Note the right-most, rectangular building the comprised the main hangar (and see below). Below is a view of the area of Parks Airport from Google Earth, 2013. It lies south and east of the intersection of Falling Springs Road and route 157, about 2.25 miles due east of the Mississippi River. The area of the old airfield is pretty much surrounded by housing today. Note the brown blotches aligned down the center of the field area, the remains of the original north-south runway. If you compare the alignment of the runway below with that shown in the aerial photograph above and in at the top of the page, you'll notice no indication of a N-S runway in the top photo and only a hint of one in the image above. In the same Google Earth image, below, I have drawn a rectangle around what remains of the original north-south runway. It is barely .4 miles long. Just a hint of the east-west runway can be seen extending below the coordinate legend at field center. Below, I have oriented the Google Earth image to coincide directionally with the 1938 photograph, above. The hangar building I have marked with an “X” at lower right is the same large hangar visible at the lower right in the 1938 image. 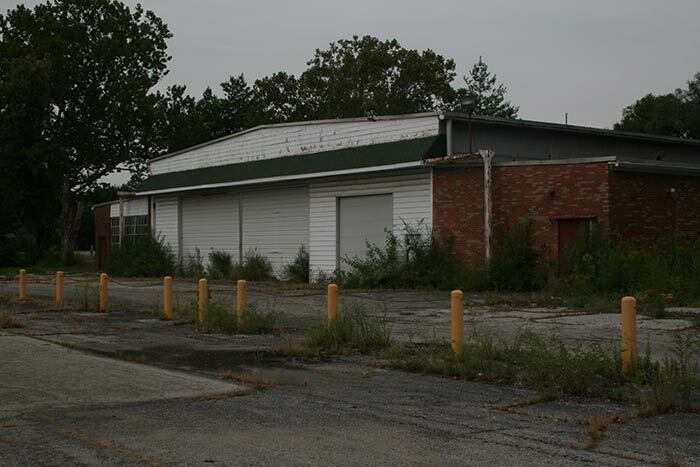 You can also see this building in the image above ringed by the driveway. Interestingly, this old Parks building is about 1.5 miles due west of the center of the present day St. Louis Downtown Airport. The latitude and longitude coordinates given in the 1937 REFERENCE are 38 degrees 35’ North by 90 degrees 11’ West. 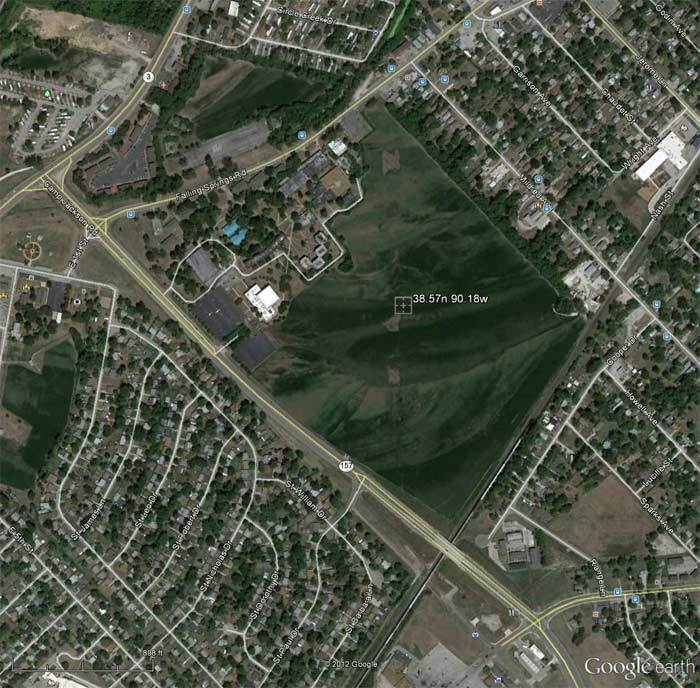 According to Google Earth, this point lies midway and south of the line joining Parks with Downtown Airport. The discrepancy may be due to measurement error in 1937. 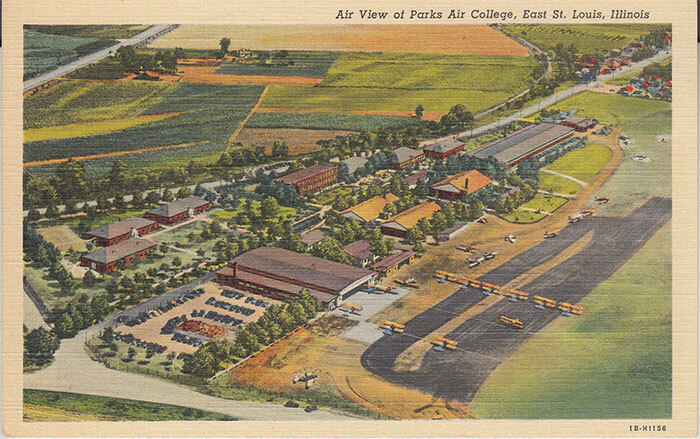 Below, a postcard showing the Parks Air College campus. The hangar building is clearly evident. 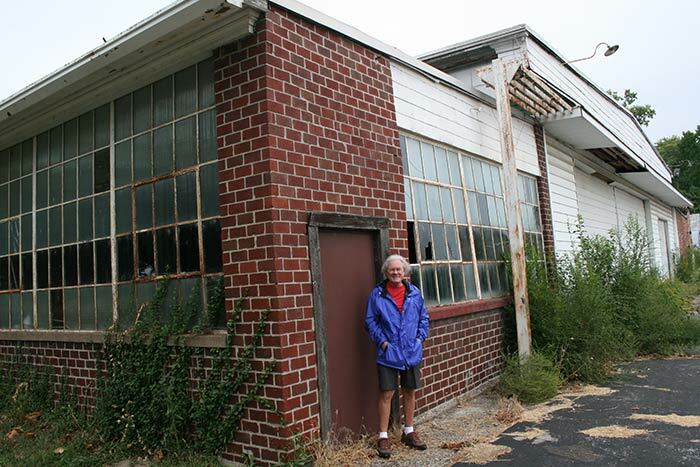 On September 17, 2013, your Webmaster had the opportunity to drive along route 157 and turn into Falling Springs road to visit the site of the old Parks Airport. Below are some views of the field and buildings. The first is a ground level panorama of the field with the original hangar highlighted in the background (i.e. the lower left corner of the photograph). I chose to exhibit this panorama long-wise so detail wouldn't be lost. Note the rail line at the right-hand side of the image. Below, your Webmaster stands next to the northeast corner of the hangar building. 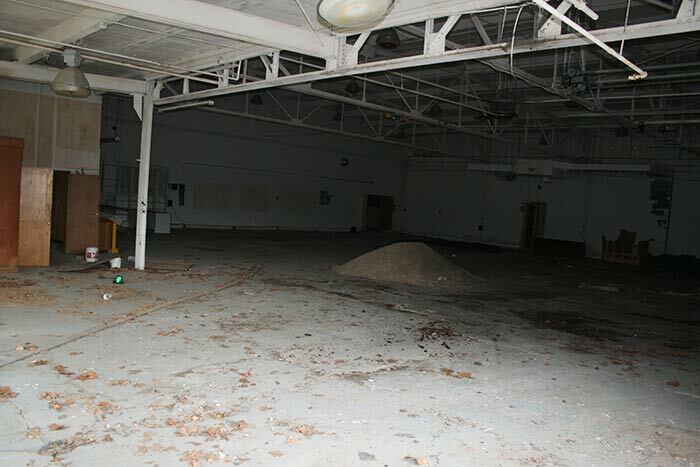 Note the broken windows that allowed photo access to the interior of the building. This corner of the building is visible in the very first aerial photograph exhibited on this page, above. It is the right-most, field-side corner of the building at lower right. 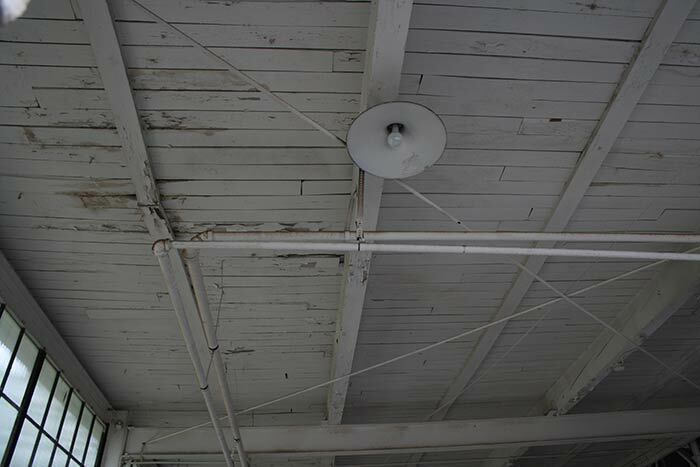 Notice the structure of the steel hangar door sliders near the roof line. 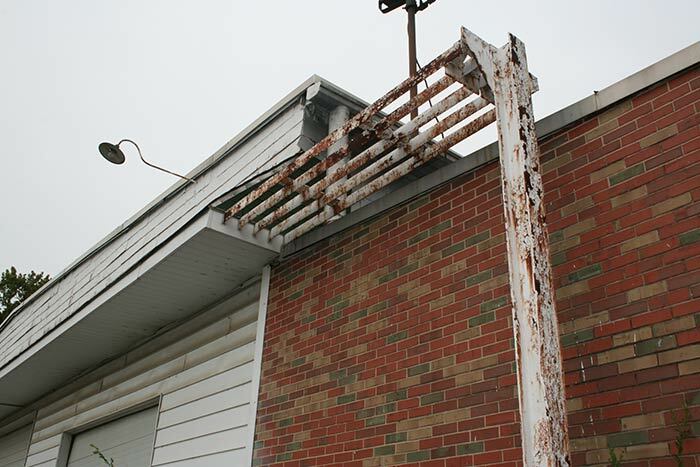 These support rails extend across the front of the hangar under the cosmetic soffit, as below. The right-hand view of the support rails is below. 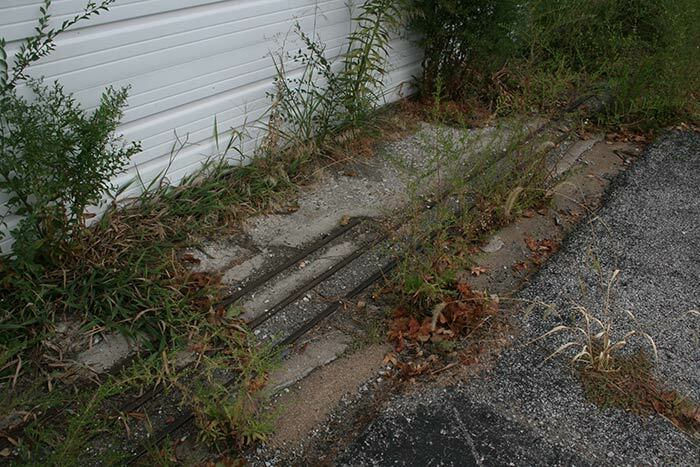 Likewise, there are ground-based rails that supported the guide wheels for the sliding doors. These are exhbited below. 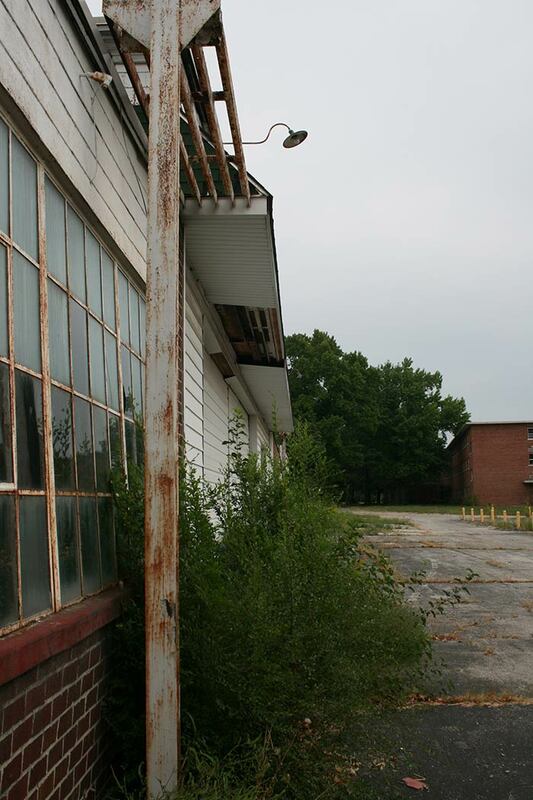 Here is an exterior view of the hangar building. Below, an interior view. Above the paint cans and to the left of the pole appear to be blueprints or posters sitting on and drooping off the edge of a work bench. A view upward towards the ceiling. Note the porcelain shade on the light. On another interior wall is this beautiful mandala featuring aviation themes understandable to any pilot. Around the periphery are airfoil shapes, round, flat and wing-like, with representations of how they behave in a stream of air. In a wind traveling counterclockwise, note the characteristic turbulence patterns produced by each shape. Stalled airfoils are at approximately 1:00 and 7:00. 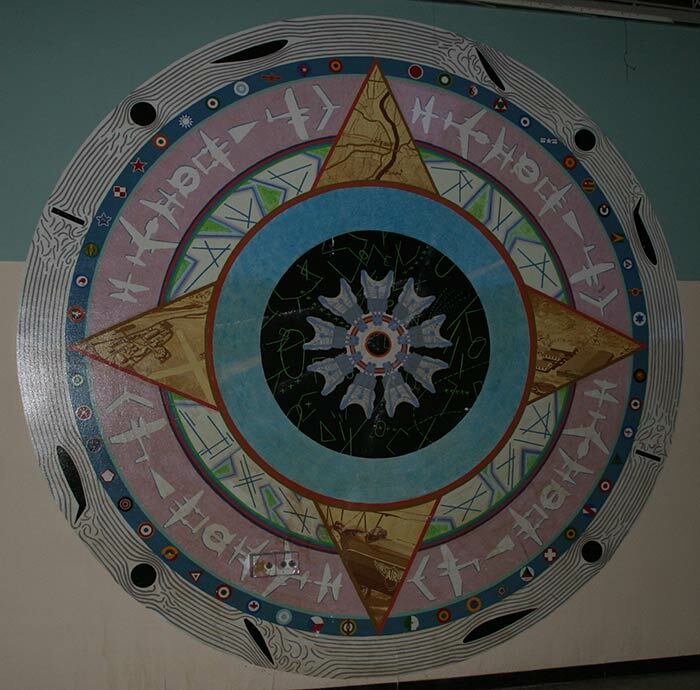 The name of the mural is "Flight Rings," and it was painted in 1982 by Robert Fishbone and his wife, who were contract muralists. Please direct your browser to the link to view artist Fishbone's other works. 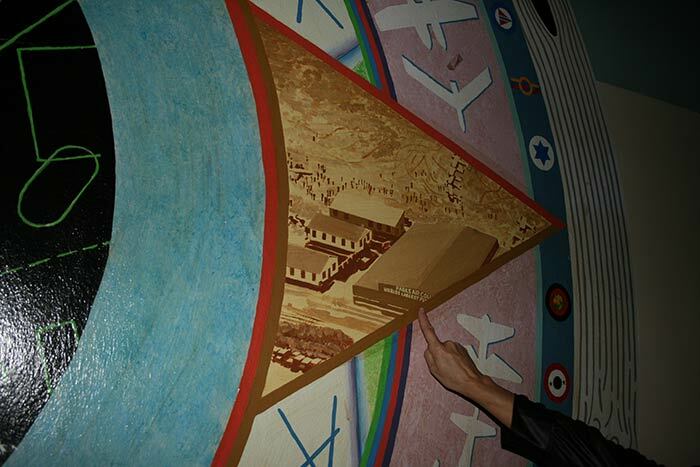 The next concentric circle includes representations of international military air force insignia. The United States is about 2:00. The next circle represents silouhettes of nine repeating airframe shapes ranging in styles from conventional to "experimental." 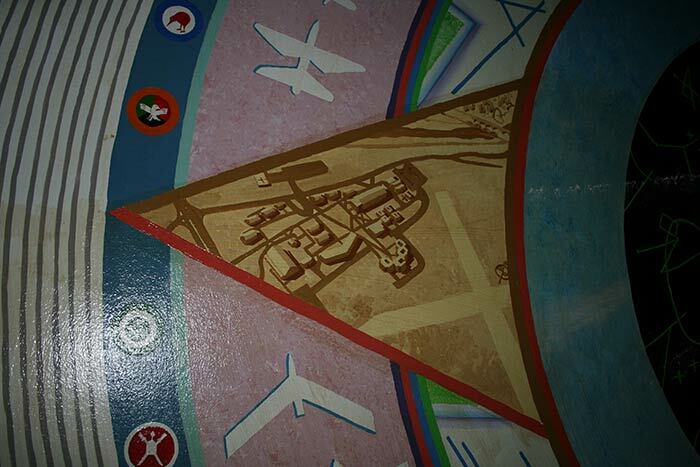 The fourth circle holds stylized representations of airfield geometries in the shape of various runway patterns. Does anyone recognize the fields from the patterns? Please let me KNOW. At the center is represented a nine-cylinder radial engine surrounded by seemingly random shapes that bring to mind constellations, air routes and, maybe, equations. Finally, the 90° points of the mandala are vignettes of various local scenes. 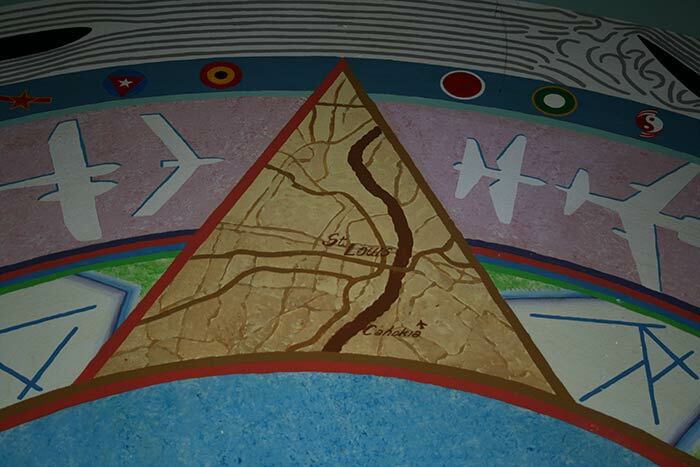 The top, 0° point, is a representation of the position of the Parks Airport in relation to city of St. Louis, the town of Cahokia and the Mississippi River. The 90° point represents an aerial view of the Parks property with the hangar signage pronouncing Parks Air College the "World's Largest Flying School." 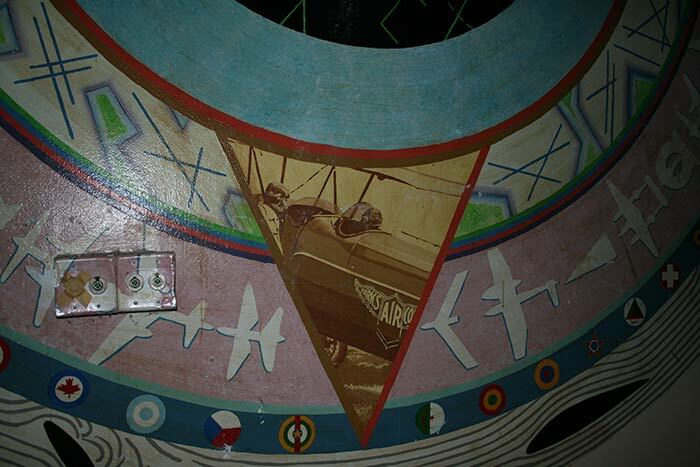 The 180° point shows a Parks trainer plane with two people talking, perhaps discussing a flight lesson. The 270° point shows an aerial view of the Parks College campus with the landing areas to the lower right and Fallling Springs Road across the top joining with Route 157 at the 270° apex. 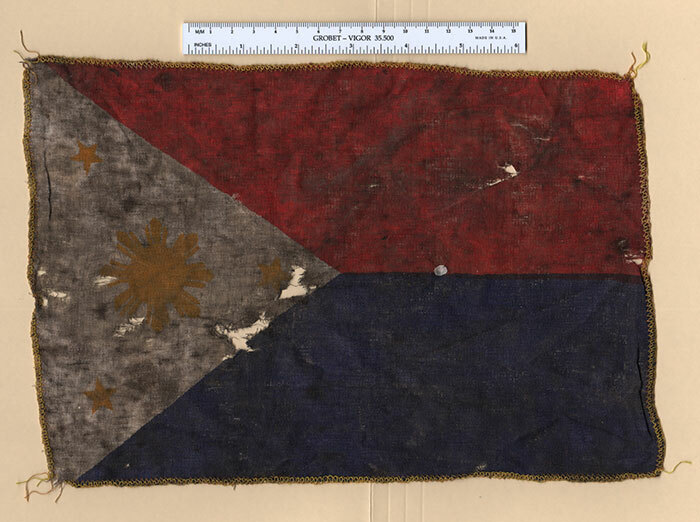 Below, found lying in decay among tall grass a distance from the hangar building, is a pennant that exhibits what appears to be a stylized radial engine design surrounded by three stars.